Find out more about the GEKA® plus hose trolley “P40” by navigating the hotspot. 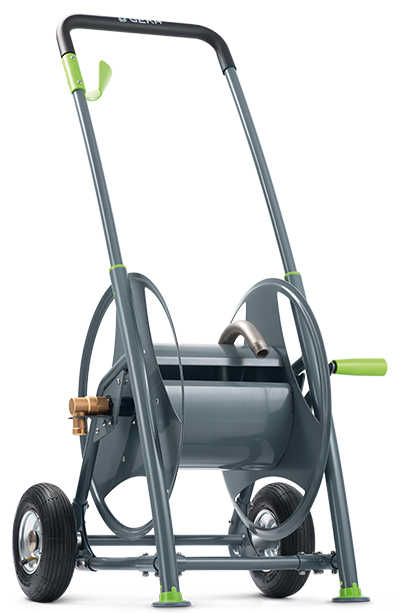 This hose trolley for gardening and landscaping, workshops or industry is truly resilient; thanks to its high-quality powder-coated steel construction, it is virtually indestructible. The optimised frame construction means it can stand with stability and also roll easily on uneven surfaces thanks to air-filled non-slip tyres. An ingenious hose guide prevents kinking and knotting, and it can be moved with little effort, thanks to its back-friendly handle height.